VHC2 Vehicle Health Check 2 is a comprehensive, automotive diagnosis and analysis tool designed for the accident and vehicle repair industry. The Wi-Fi enabled diagnostic tablet connects to vehicles via a Bluetooth VCI (Vehicle Communications Interface). With coverage across more than 60 vehicle makes throughout Europe, America and Asia. Carry out scans and re-sets in-house. Complete accurate pre and post-accident diagnostic scans and resets in-house saving you time and money. Full diagnostic reports can be shared directly with your Audaenterprisegold assessments. is used on every job as a best practice measure, to ensure consistency and quality. VHC2 provides diagnostic reporting at the first point of a repair, protecting Banburys and its customers. 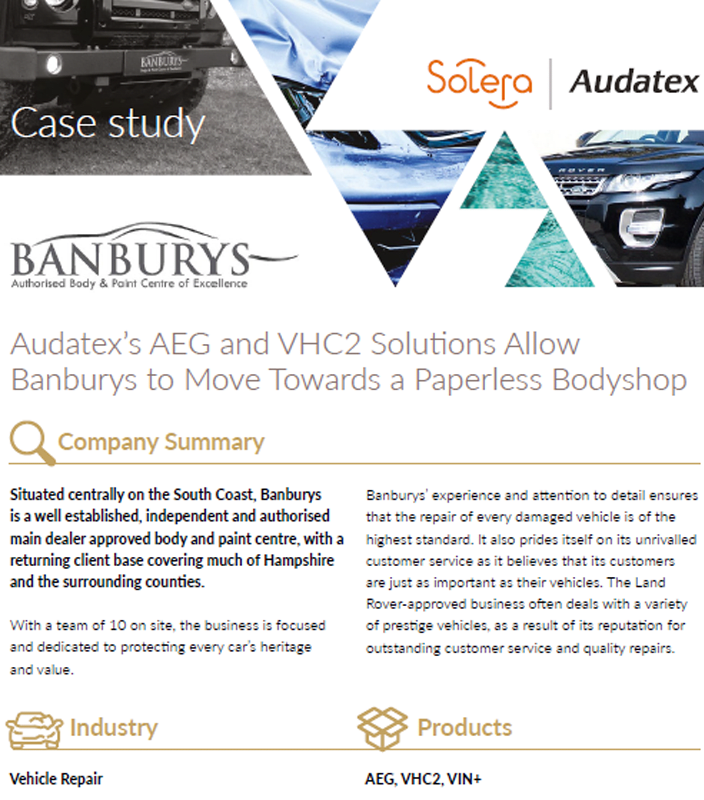 Prior to its long term integration of VHC2 during the pilot period, Banburys provided vital feedback on usability and functionality of the solution and also the image integration with AEG. Your key to greater efficiency and customer satisfaction in automotive estimation and accident repair. Access accurate technical data covering 99% of vehicles on the road today. PlanManager is an innovation in bodyshop management, for greater efficiency and workflow streamlining.